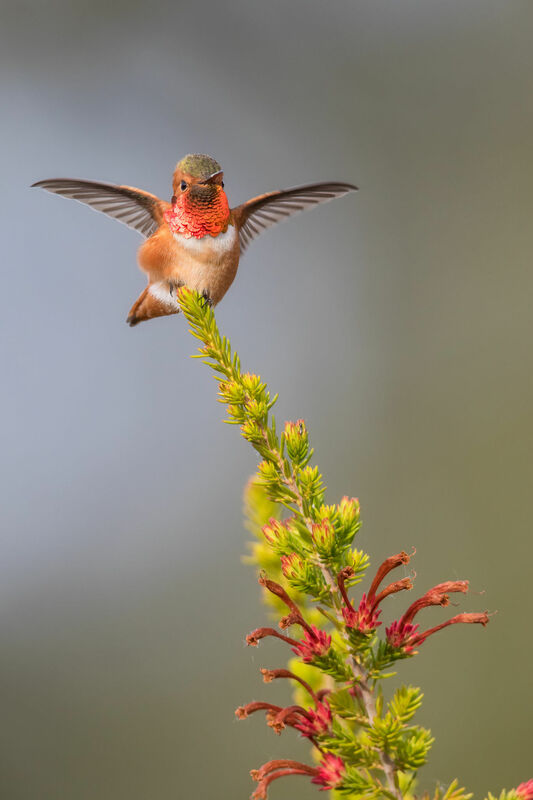 Allen’s hummingbird (Selasphorus sasin) is a species of hummingbird. It is a small bird, with mature adults reaching only 3 to 3.5 in (76 to 89 mm) in length. The male has a green back and forehead, with rust-colored rufous flanks, rump, and tail. The male’s throat is also an iridescent orange-red. 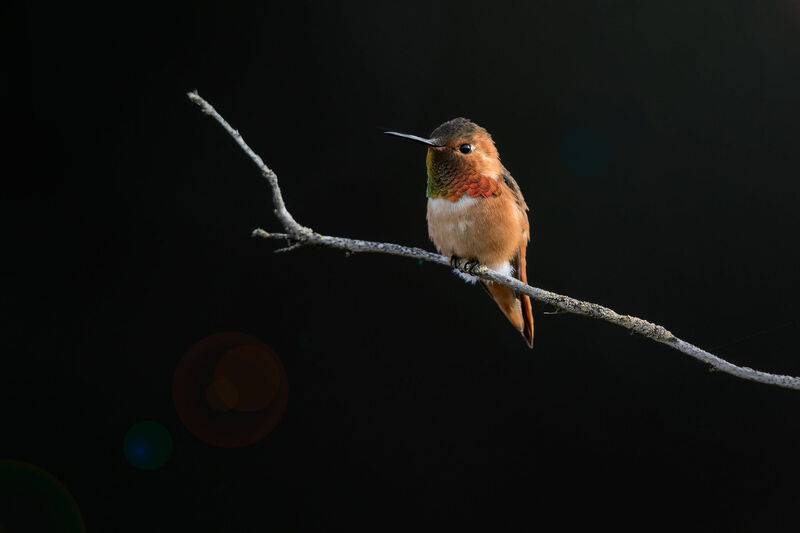 The female and immature Allen’s hummingbirds are similarly colored, but lack the iridescent throat patch, instead having a series of speckles on their throats. Females are mostly green, featuring rufous color only on the tail, which also has white tips. Immature Allen’s hummingbirds are so similar to the female rufous hummingbird, the two are almost indistinguishable in the field. Both species’ breeding seasons and ranges are common factors used to differentiate between the two species in a particular geographical area. 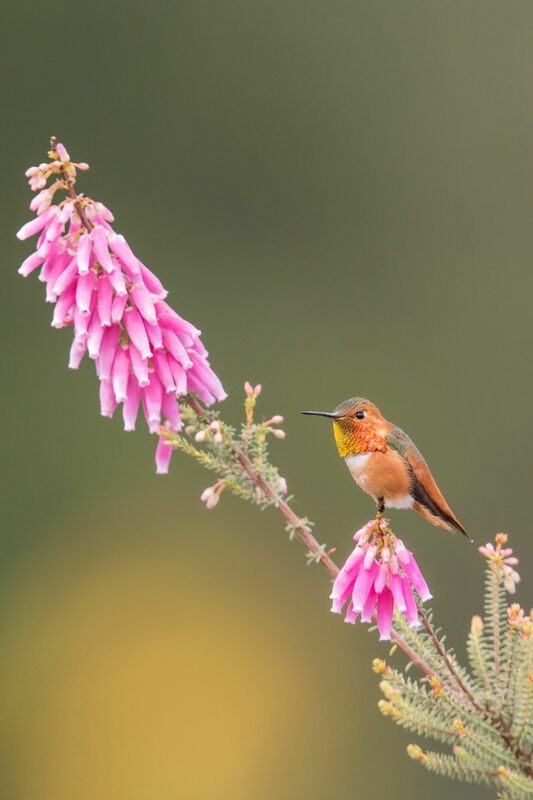 Allen’s hummingbird is common only in the brushy woods, gardens, and meadows of coastal California from Santa Barbara north, and a minuscule portion of lowersouthern Oregon. 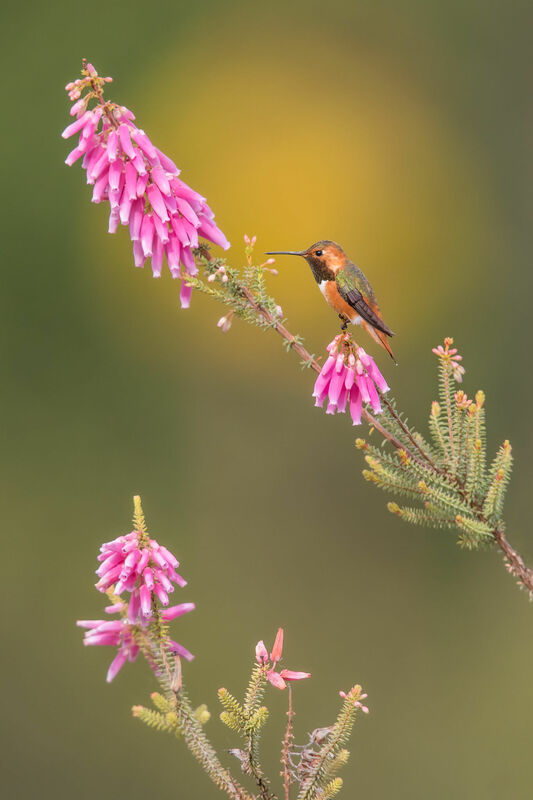 The nominate race of Allen’s hummingbird, S. s. sasin, is migratory, and winters along the Pacific coast of central Mexico. A second ,S. s. sedentarius, is a permanent resident on the Channel Islands off southern California. This population colonized the Palos Verdes Peninsula of Los Angeles County in the 1960s and has since spread over much of Los Angeles and Orange Counties, south through San Diego County, and east to the western end of Riverside County (inland empire). 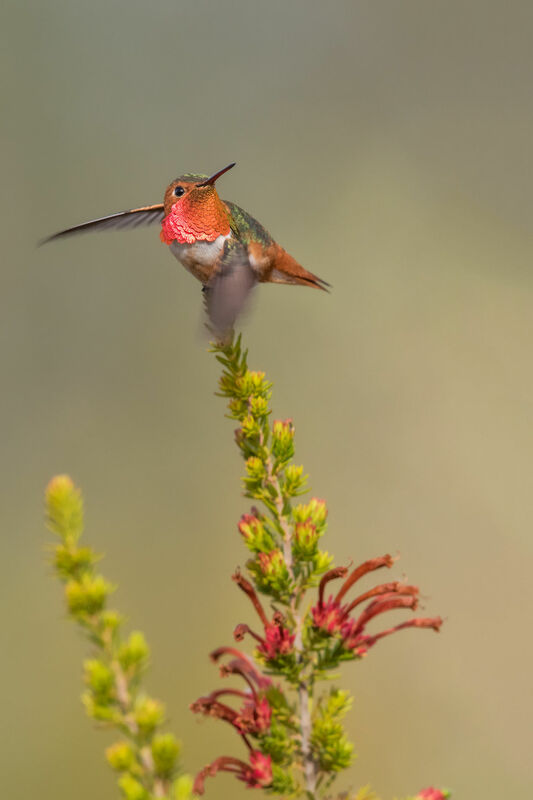 The courtship flight of male Allen’s hummingbirds is a frantic back-and-forth flight arc of about 25 ft (7.6 m) similar to the motion of a swinging pendulum, followed by a high-speed dive from about 100 ft (30 m). The male is also highly aggressive and territorial. Hot-tempered despite its diminutive stature, male Allen’s hummingbirds will chase any other males from their territory, as well as any other hummingbird species, and have even been known to attack and rout predatory birds several times larger than themselves, such as kestrels and hawks. 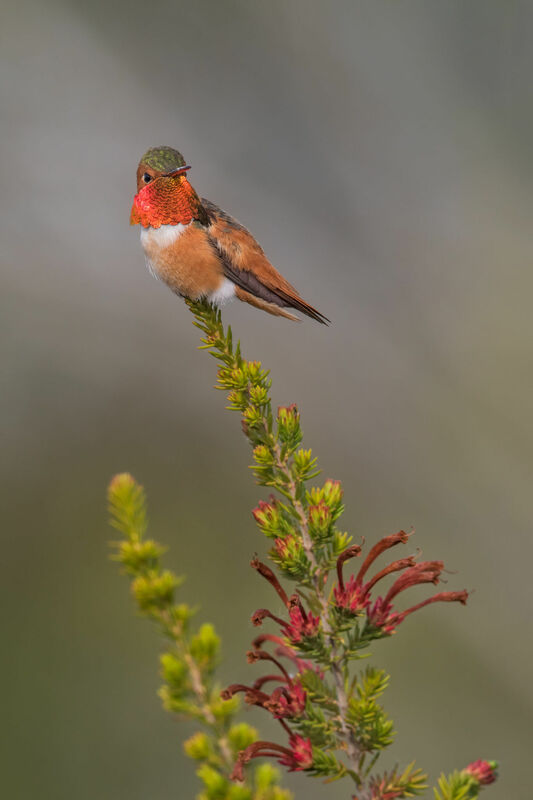 Allen’s hummingbird constructs its nest out of plant fibers, down, and weed stems, coating the nest with lichens to give it structure. The nest is placed above ground on a tree branch or the stalk or stem of a plant. The female lays two white eggs, which she incubates for 15 to 17 days. The young leave the nest about three weeks after hatching. The mother continues to feed the fledglings for several more weeks, then the young are left to fend for themselves. 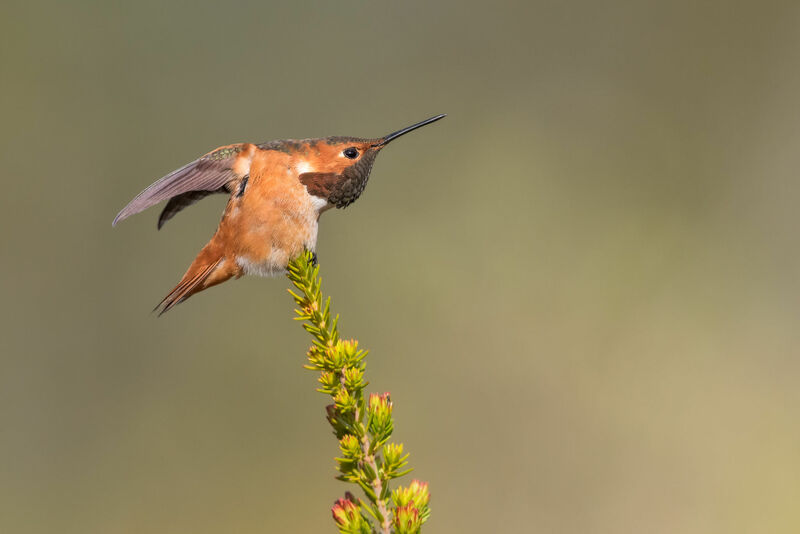 Like all hummingbirds, Allen’s hummingbird’s high rate of metabolism requires it to feed frequently, about every hour. It drinks nectar from flowers and eats any small insects it finds crawling around the flower blossom, which provide it with needed protein.